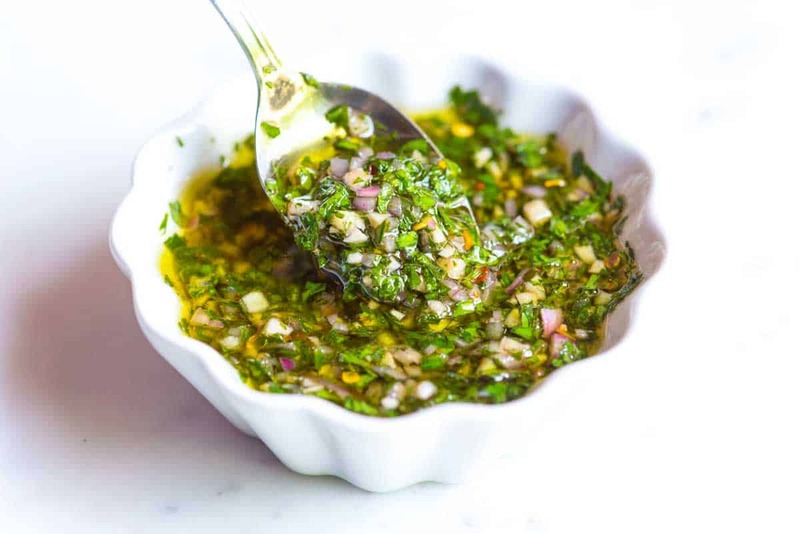 Chimichurri is a zesty, green sauce made with fresh herbs, garlic, vinegar, chili pepper and olive oil that livens up pretty much anything you throw at it. 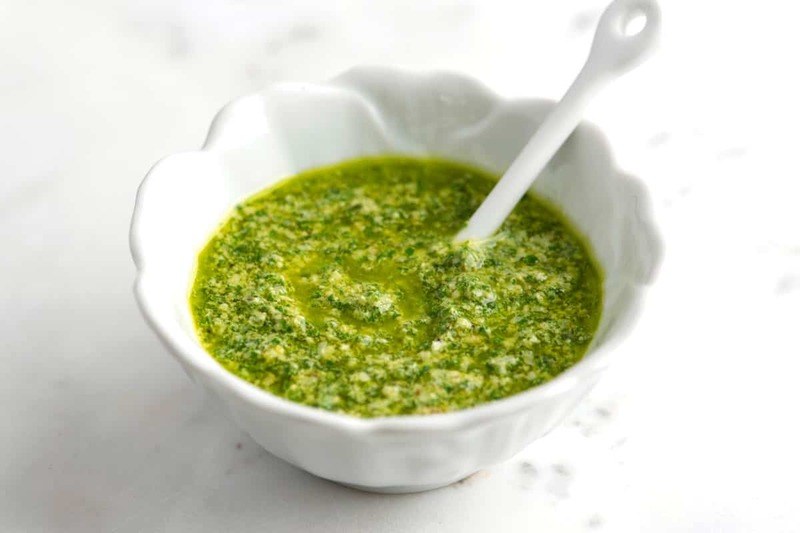 Jump to the Homemade Chimichurri Sauce Recipe or read on to see our tips for making it. It’s as versatile as your favorite white t-shirt. You can use it 100 different ways. Steak, shrimp, fish, vegetables and chicken all love it — especially if they’re grilled or roasted. It even passes tossed with pasta or spooned over fresh tomato slices. 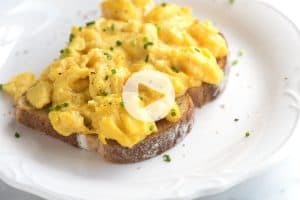 Stirring it into scrambled eggs is a good idea, too. 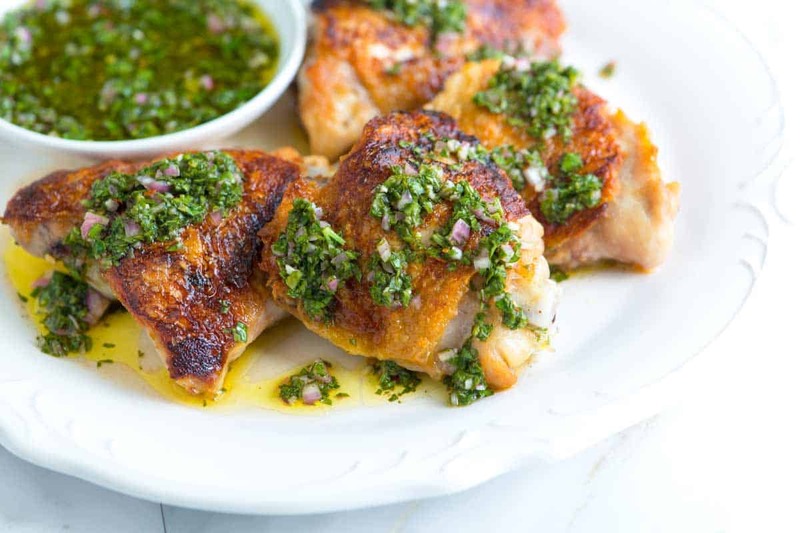 YOU MAY ALSO LIKE: Try Our Chimichurri Chicken Thighs Recipe. We share how to cook chicken thighs with perfectly crispy skin. 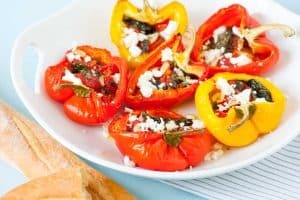 They are incredible topped with this chimichurri recipe. You can make the sauce by hand (our preference) or with the help of a bender or food processor. By hand works perfectly fine for us, especially since we like the sauce with more texture. Our recipe calls for parsley (although you can use other herbs — see below), garlic, shallot, crushed red pepper flakes, red wine vinegar and olive oil. Chop everything really, really small then give it a good stir. Leave the sauce for 20 minutes or so to help all the flavors come together and serve. Chimichurri is excellent the day you make it, but it will last a few days in your refrigerator (you just might notice the parsley’s green dulls slightly). We usually stick to parsley for our sauce, but lots of people really love to switch parsley for cilantro and make a cilantro chimichurri. We’ve seen a combination of both herbs used, too. A little fresh mint or oregano — we prefer dried — is great, as well. Once you have the base, you can play around depending on what ingredients you have or what you plan to serve it with. YOU MAY ALSO LIKE: How to make the best pesto with basil, nuts, garlic, and olive oil. Jump to the Easy Basil Pesto Recipe. 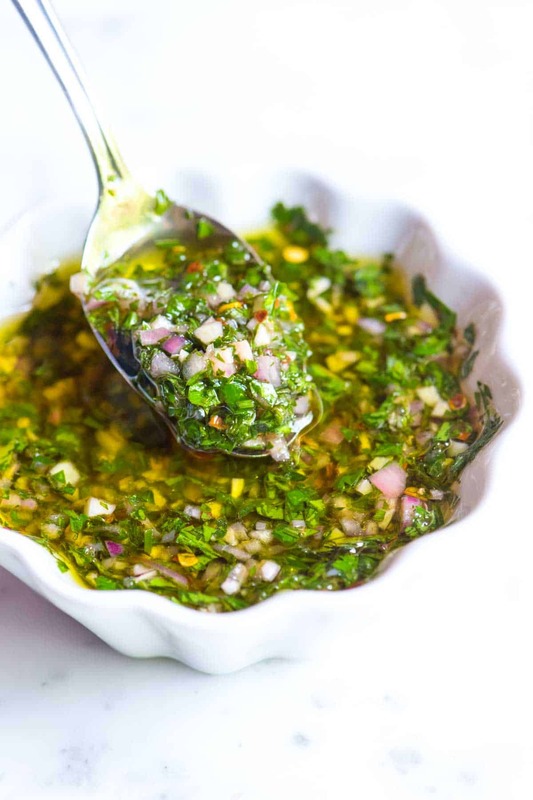 Chimichurri sauce is made with fresh herbs, garlic, vinegar, chili pepper and olive oil. It livens up pretty much anything you throw at it and you can use it 100 different ways. Try spooning it over steak, shrimp, chicken and vegetables. 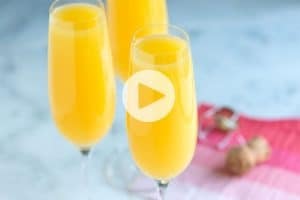 You can also toss it with pasta or rice. We like our sauce on the tangy, vinegary side. If you prefer things to be a bit more tame, reduce the amount of vinegar to 3 or 4 tablespoons. 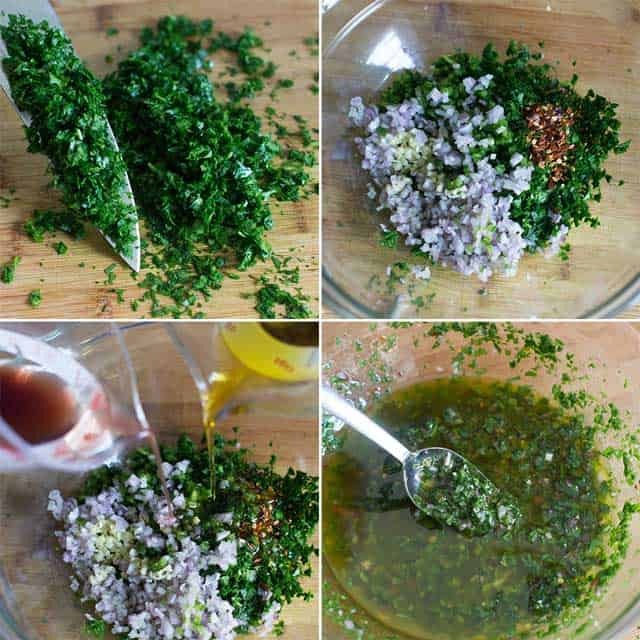 Finely chop the parsley then add to a bowl with the garlic, shallot, salt, red pepper flakes (or chopped chile pepper), olive oil and the red wine vinegar. Stir. (Or, puree all ingredients in a food processor or blender). Let the sauce stand at room temperature for 20 minutes before serving. The sauce is excellent the day you make it, but it will last a few days in your refrigerator (you just might notice the parsley’s green dulls slightly). Once you have the base recipe, you can play around with it depending on what ingredients you have on hand. Try switching parsley for cilantro, or use a combination of both herbs. A little fresh mint or oregano is also a really nice addition. I just made this and it worked out so well for me! Delicious on top of my tri-tip lunch and I can’t wait to try it on other things. So easy and straight forward to follow your instructions! Thank you!